Have you ever seen wind blowing over water when the instability manifests in waves on the water surface? Well, it’s similar for the Kelvin-Helmholtz (K-H) waves. To be more specific, “Kelvin-Helmholtz Instability” can be excited at the interface if there is sufficient velocity shear between the two separated flows. When that happens, K-H waves or vortices will transport solar wind plasma, momentum, and energy into the magnetosphere. It is well acknowledged among space physicits that K-H Instability is one of the major transport mechanisms during northward interplanetary magnetic field (IMF), the study of which is of vital importance. Previous researchers prefer to use local simulation models or in-situ observations to analyze the excitation and evolution of K-H wave. The disadvantages lie in that only a small region of the K-H wave is considered; the three-dimensional large-scale process is therefore overlooked or seldom addressed. Recently, a research group headed by Prof. WANG Chi at the State Key Lab. of Space Weather, the National Space Science Center, has investigated the three-dimensional processes of K-H wave and presented lots of quantitative results using a self-developed global simulation model named as PPMLR-MHD (Fig. 1). The numerical results are proved to be in consistency with the in-situ observations. 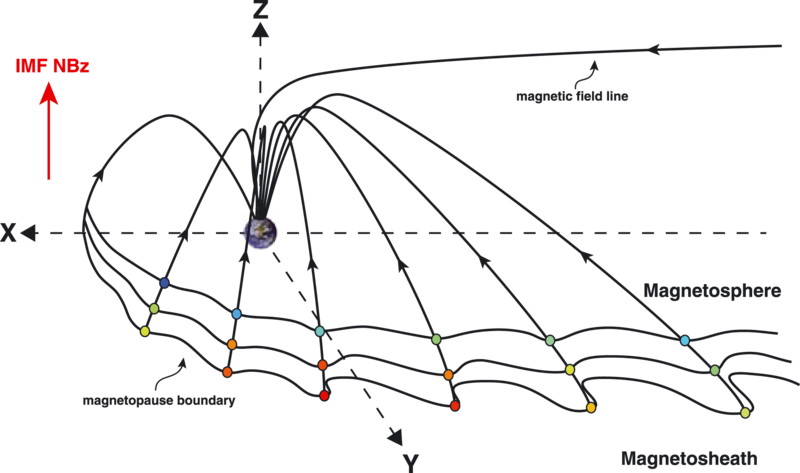 Time History of Events and Macroscale Interactions during Substorms, or THEMIS for short, is a NASA mission to investigate macroscale processes in the magnetosphere. Two of its five spacecraft are ideal detectors for low-latitude boundary layer study. As principal members in Prof. Wang’s group, LIN Dong, Dr. LI Wenya, and Dr. TANG Binbin, found 14 K-H events based on THEMIS-B and C observation. With combined efforts, they created the largest K-H case databases (56 cases) from the THEMIS events. 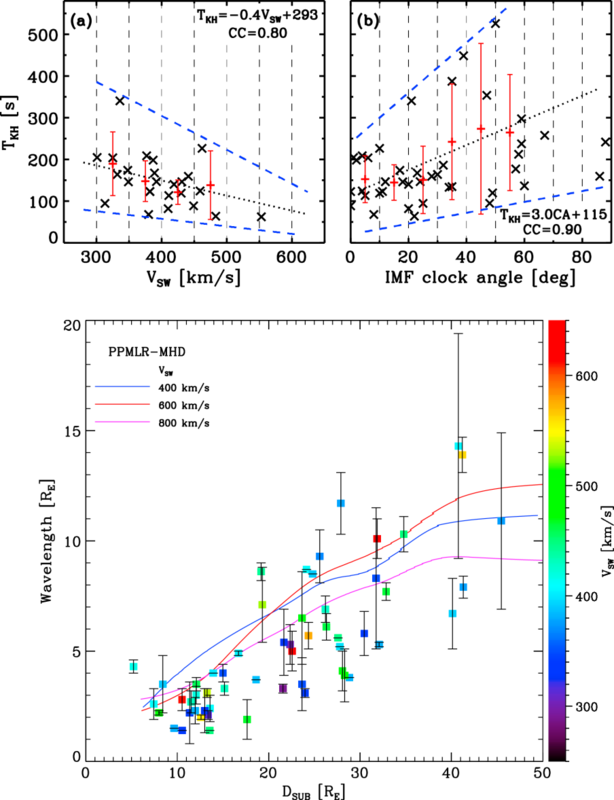 They calculated the K-H wave period using spectral analysis method, estimated the phase speeds from the center-of-mass velocity of the K-H vortex, and computed wavelengths from the periods and phase speeds. The results show that all the wave periods (from 90 s to 350 s) are within the magnetosphere ultra-low frequency wave band. 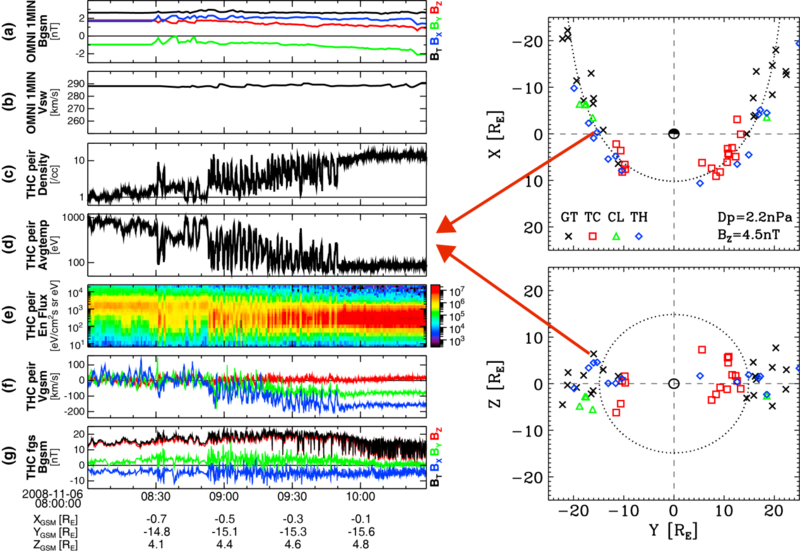 And the periods tend to be longer during slower solar wind speeds and/or during larger IMF clock angles; the wavelengths increase continuously from dayside to nightside magnetopause (Fig. 3). Those results show remarkable consistency with their previous results from PPMLR-MHD simulation model. It is the first statistical study to investigate the quantitative properties of K-H wave during northward IMF with spacecraft observation. It will improve our understanding on the overall picture of K-H instability, and in general, benefit the solar wind transport study during northward IMF. The work, entitled as Properties of Kelvin-Helmholtz waves at the magnetopause under northward interplanetary magnetic field: Statistical study,was published on the Journal of Geophysical Research---Space Physics hosted by the American Geophysical Union(AGU).